Advance Auto Parts will serve as the title sponsor for NASCAR’s opening exhibition race of the 2017 Monster Energy Cup Series season at Daytona International Speedway, the track announced Wednesday. The Advance Auto Parts Clash will open the 2017 NASCAR season under the lights on the evening of Feb. 18, featuring an elite field of Monster Energy NASCAR Cup Series drivers in a 75-lap sprint that will be televised live on FS1. The annual all-star event was first held in 1979 and originally was known as the Busch Clash. A number of name changes ensued over the years, with the most recent being the Sprint Unlimited. 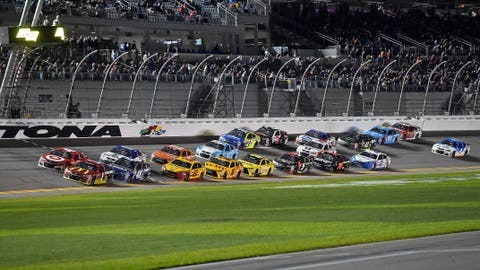 But with Sprint leaving NASCAR as its title sponsor at the end of last season, Daytona had long been in search of a new sponsor to partner with even as it made it clear it also wanted to make a return to calling it the “Clash” once again. Advance Auto Parts finally stepped up and agreed to what Sports Business Daily reported was a multi-year deal. In addition to the race entitlement, the track said in a statement that Advance Auto Parts will also serve as the Official Auto Parts Store of DIS. The 75-lap/187.5-mile race will be split into two segments, separated by a mandatory caution period at Lap 25. The race will be televised live on FS1 at 8 p.m. ET. Recently crowned seven-time NASCAR Premier Series champion Jimmie Johnson will be part of the field that meets exclusive criteria: 2016 pole winners, former Clash champions, former Daytona 500 pole winners who competed full-time in 2016 and Chase playoff participants from 2016 are eligible. The first official points race of the 2017 NASCAR Monster Energy Cup Series season will follow Feb. 26 when the green flag flies for the Daytona 500, which will be televised live on FOX.